Clare was a difficult game to assess from a Derry perspective; a point gained or one dropped? Pre-match expectations dictated anything other than two points would represent a bad return for Damian Barton’s team. From that viewpoint disappointment is the over-riding emotion. Yet consider the circumstances. None of the Slaughtneil contingent available. Five of your back six making their National League debuts. A disjointed opening half lacking any type of intensity. The concession of a 74th minute point that left the team one behind despite a vastly improved second half. Navigating those circumstances to emerge - if not unscathed then at least afloat - has to count for something for a young team still seeking a system of play that best suits it. It says plenty about the character of the squad. Ciaran Russell’s injury time point would have finished most teams, especially on an afternoon when a lot of things the home side tried didn’t come off. James Kielt’s wonder point (as team mate Neil Forester described it afterwards) was just reward for the character but character alone is not enough in the modern game. How you view Sunday’s result depends on how you see ‘Project Derry’. Barton will say he simply wants to win games but the former All Ireland winner knows football well enough to know what to expect when you introduce as many young players as he has to the senior inter-county scene this season. For those expecting instant success, Sunday was further ammunition with which to take more pot shots. The first half was poor and Clare found it alarmingly easy to pick their way through the Derry defence at times. The Banner County hit 14 wides over the course of the game and should have scored at least three goals. The top teams are not as generous. Those expecting ‘Project Derry’ to pay instant dividends are likely to be left disappointed. But there is another outlook. 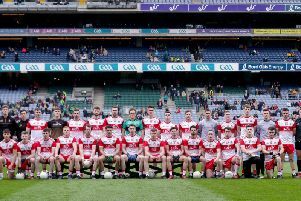 Barton’s squad overhaul - enforced or otherwise - is essentially a fast track system for many of the players who ended Derry’s 13-year search for an Ulster title at minor level in 2015 under Damian McErlain. The step up from minor, or even Under 21, to senior is huge but these players are gaining crucial experience, playing the top sides and will develop into a real force. The question is more a ‘when’ than an ‘if’. From that viewpoint, Sunday was another necessary step in a process which will take time and may eventually prove more beneficial to future Derry management teams than to the current set-up. Taper your expectations with that outlook and the manner in which the team refused to accept defeat and fought back despite not playing well seems a positive step in the right direction. And there were passages of positive play, particularly in the second half when Derry paid the price for going for goal too often with half chances that would probably have been better tapped over the bar. The first half was one to forget and how Derry went in one point up was probably as much a mystery to Derry as it was to Clare manager Colm Collins. The second half saw both sides miss chances and in an era when it is essentially part-time county teams versus full-time county teams, neither looked ready to mount a promotion bid for Division one football. Three or four more matches will prove how critical Kielt’s beautiful late point was and 2017 looks too early but don’t dismiss ‘Project Derry’ too quickly.